ZooEasy has tremendous features. Simple, easy to use and very professional. Should you have any further questions, please feel free to contact us by E-Mail. Record all index data including breed, color, parents, breeder and owner. Fantastic search function for selecting pheasant data. Print up to 5 generations in one pedigree, including picture and your own watermark or logo. Easily change an incorrect ring number. Brilliant default check to prevent double ring numbers. Fast retrieval of lists of pheasants owned. 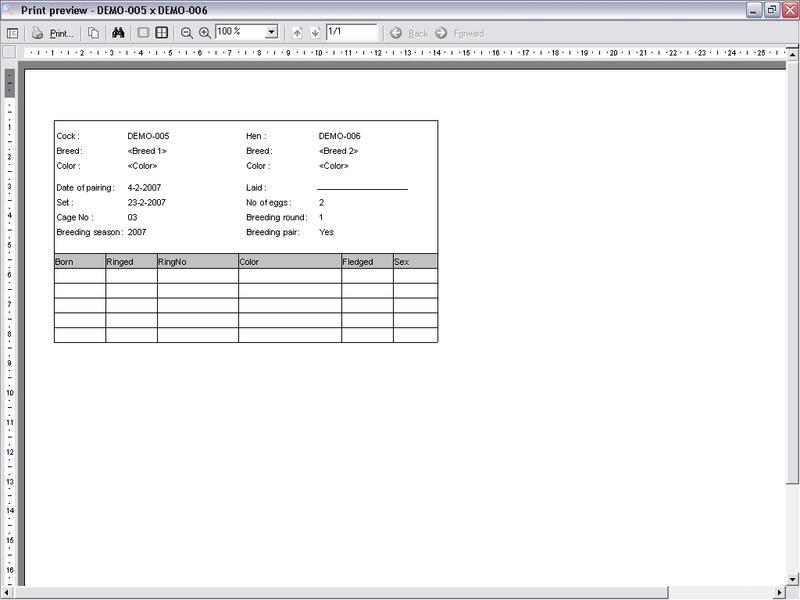 Quick data entry of brothers and sisters by means of a copy function. Easily enter a digital picture for each pheasant. Unlimited recording of medical history and genetic information. Print an index card for each pheasant including all relevant details. Quick-sort pheasants by breed or color. Record pheasants with or even without a ring number. Record details of pheasants purchased and sold. Sales module automatically adds the sale of a pheasant to finances + checks whether the pheasant may be sold. Easily distinguish between pheasants from different seasons. Print labels with the pheasant's details. Common ancestors are marked in the pedigree. This very quickly enables you to see which pheasants cause inbreeding. Store the weight scheme per pheasant. Request a graph with the weight development per pheasant. Create a relationship matrix which shows how closely pheasants are related. Quickly add pheasants from within the pedigree in order to complete incomplete pedigrees. Separate administration of different breeds by tabs. Enter multiple measurement values of body characteristics. Categories can be added easily. Link with, amongst others, Word and Excel documents in order to archive and edit (scanned) files such as medical examinations, images of examinations as well as transport documents, directly from within ZooEasy. Store several pictures pertaining to an animal. Edit pictures directly from within ZooEasy. Print your own breeding cards for use on cages. 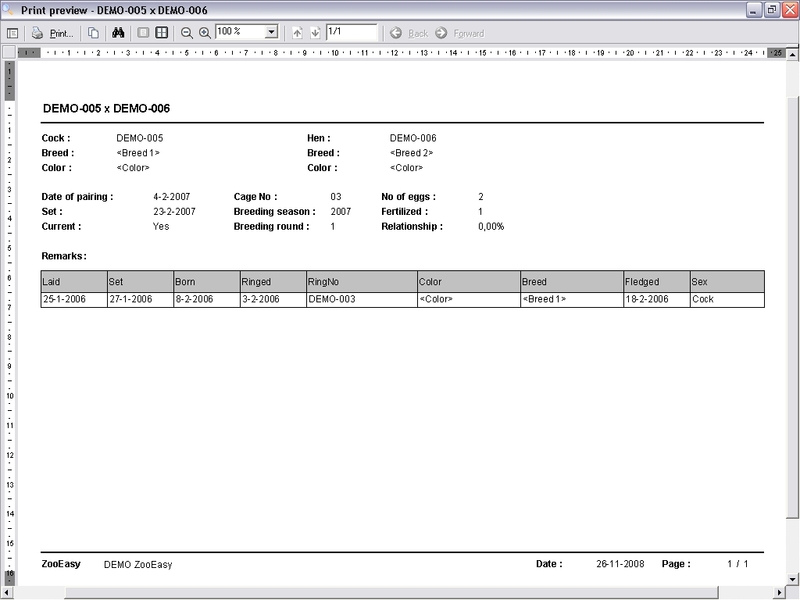 Date of birth is automatically calculated and added to the logbook as a reminder. Compose trial pairs by relationship percentages. Compare breeding results year by year. 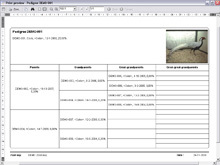 Sophisticated search function for selecting breeding pair data by means of search criteria. Record information for every breeding round. 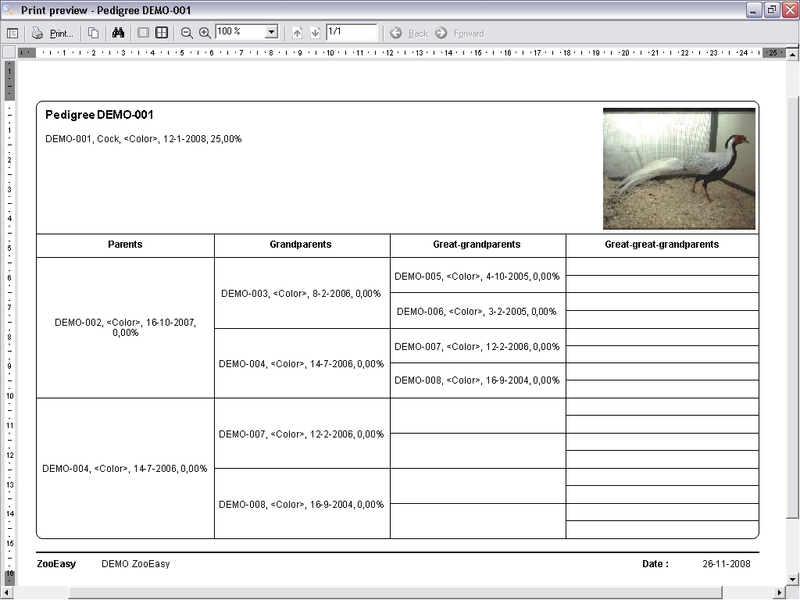 Print labels with the breeding pair's details. Automatic safety check for breeding pairs entered twice. Use fictitious ring numbers in case the eggs entered have to be recorded in advance. Quickly create a new breeding round. Easily distinguish between breeding pairs from different seasons. Print an entry form for all breeding pairs. Quick-sort breeding pairs by breed or cage number. Enter the weight scheme of descendants. Show the weight development of all descendants in a graph. In this manner data can be compared. Store several pictures pertaining to a breeding pair. Export the complete pedigree of a certain pheasant to a file and/or send it by E-mail. Import the exported file from another ZooEasy user and add it to your own administration. Privacy sensitive data and medical data will not be exported. Convenient to provide other ZooEasy ysers with a complete pedigreewhen selling a pheasant. Import data from other pedigree registration programs by means of an Excel file that has been defined beforehand. Easily distinguish between show results of different seasons. Compare show results year by year. Superb search function for the retrieval of show results. Quick-sort show results for each pheasant, season or breed. Store several pictures pertaining to a show result (eg. show report or the prize won). Create and keep a well-organized contact list. Find your contacts at a glance. Link with, amongst others, Word and Excel documents in order to archive and edit (scanned) files related to contacts, directly from within ZooEasy. Store pictures pertaining to a contact. Record your income and expenses. 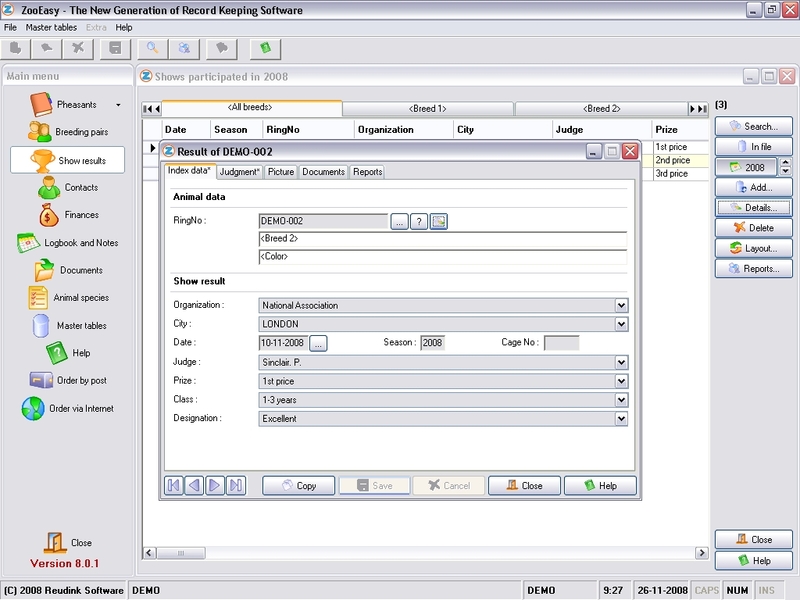 Create reports stating the annual balance for items of your choice. All totals are illustrated in a graph. Easily distinguish between revenues and expenses in different periods. Never lose important data using the ZooEasy (automatic) backup function. Easily make backups on your hard disk, CD-R(W), DVD-R(W), flash disk, floppy disk, etc. Password protection, require a password to access ZooEasy or restrict access only within sensitive areas such as your financial information. 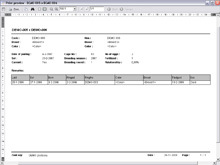 Print pedigrees and other reports with customizable content and use the Internet to publish them or send them by E-Mail. Add your own watermark or logo to each report. Produce an index card for each pheasant, including or excluding remarks and details. Export reports to several formats unlimitedly. Breeding pairs sorted by cage number, breeding round and season. 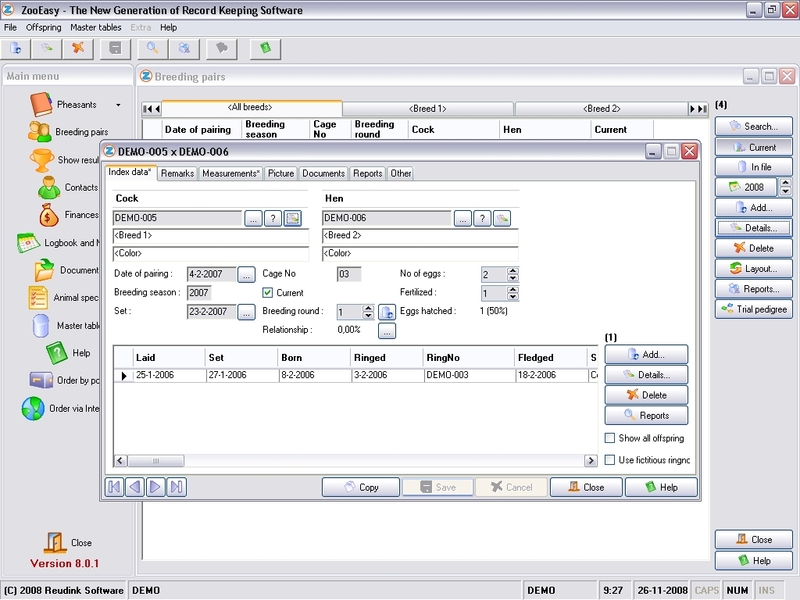 Numerous sorting options are available for printing various reports. 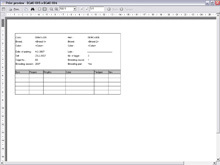 Freely customizable reports and printing options. Print preview included for all reports. Lists of changes in pheasant collection during a particular period. ZooEasy is suitable for all breeds and also for clubs and associations. Entry is checked while recording the details. ZooEasy is mouse and keyboard driven. Suitable for Windows 8, 7, Vista, XP and 2000. User friendly, easy to use for everyone. PDF and case sensitive online manuals included. FREE Helpdesk support during subscription period. NO shipping or handling costs. Secure and simple payment solutions. 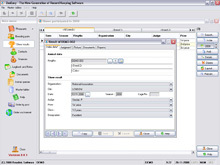 Fully customized programs can be developed. ZooEasy is dedicated to continuous development.